I have been so busy this month and it is supposed to be my month off! I have been busy stitching new projects for my spring classes. My open house to showcase the new spring projects will be February 5, so if you live in my area, you are welcome to come! 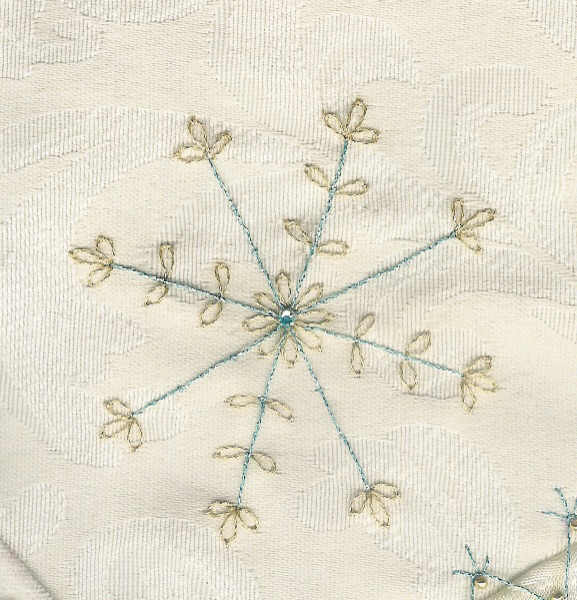 Along with stitching new projects, I have been working on other things. The top picture is the result from taking a class from Carole Samples when she was here in November. The class was Build a Better Block. I am happy with the result, but I can tell you, my block is very simple compared to the complex and beautiful blocks that other students were making! I'll keep you posted as I embellish it. 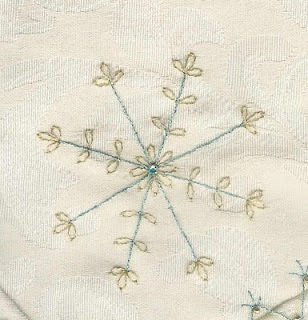 Here is another embroidered snowflake that I have done on one of the projects for the spring classes. I have also been busy putting together the Victorian Stitchery Retreat for 2011. I have four wonderful teachers lined up and the dates for the retreat will be November 7-10. I have had the retreat at the same venue all the years I have done this, so I decided it was time for a change! The retreat will now be at the Old Town Hotel! You can get more info on the hotel at www.hotelatoldtown.com. There is a lot to do in the area with 15 restaurants within a two block radius of the hotel. The area is also filled with little boutiques, museums and a movie theatre. Invitations for the retreat will go out in mid-February, so if you are interested in coming just let me know!